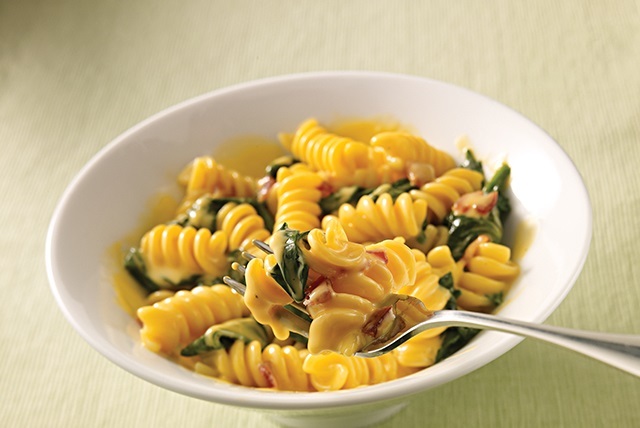 Slip some spinach into their dish—deliciously—in a quick pasta side made with Sharp Cheddar VELVEETA and crumbled bacon. Cook pasta in large saucepan as directed on package, omitting salt. Meanwhile, cook spinach in nonstick skillet on medium heat 5 to 7 min. or just until wilted, stirring frequently. Drain pasta; return to pan. Add spinach and all remaining ingredients; cook on low heat 3 to 5 min. or until VELVEETA is completely melted and mixture is well blended, stirring frequently. Enjoy your favorite foods on occasion but remember to keep tabs on portions. Prepare using farfalle (bow-tie pasta) or your favorite shaped pasta.